“The man who wishes to keep at the problem long enough to really learn anything positively must not take dangerous risks. Carelessness and overconfidence are usually more dangerous than deliberately accepted risks,” said Wilbur Wright. He continued, “They would take risks when necessary, but they were not daredevils out to perform stunts and they never would be.” In addition to the brothers’ study of flight attempts of others and the manner that birds fly, the brothers took many cautious steps in preparation for their first flight experiences. The brothers realized that their home town of Dayton, Ohio was not ideal for flight experiments. Instead, they sought a location with consistent winds and soft sand to test their machine. Wilbur first inquired with Octave Chanute, an engineer, for advice on where to conduct flying experiments. But the locations in California and Florida that Octave knew of were “deficient in sand hills” for soft landings. Instead, Octave suggested the coasts of South Carolina or Georgia might be better. Wilbur Wright inquired with the United States Weather Bureau about the prevailing winds around the country. The Bureau responded with records of monthly wind velocities of more than one hundred weather stations around the country. A spot called Kitty Hawk on the Outer Banks of North Carolina stood out. Wilbur even went so far as to assure his father that he was taking “every precaution” about his drinking water in the Outer Banks. 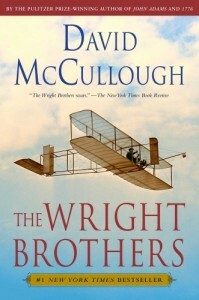 Read more about the ups and downs of the Wright Brothers’ work in McCullough’s book, which is a worthy read.